In 2012, then-presidential candidate Mitt Romney took some heat for calling Russia the United States’ “No. 1 geopolitical foe.” Fast forward a few years, and the U.S. is investigating Russian interference in the 2016 presidential election. Voter databases in 21 states were targeted. And now Romney is running for U.S. Senate. The candidate says he’s not aware of any attempts by the Russian government to target his campaign. 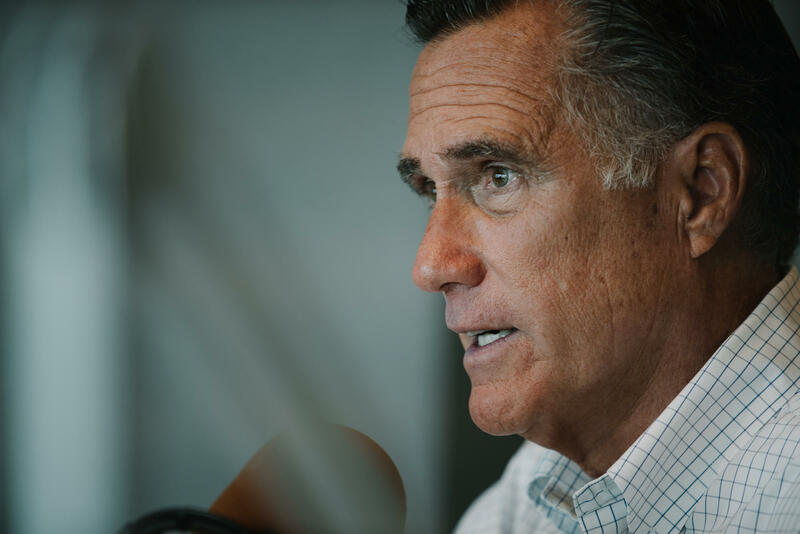 “I have a very effective campaign manager that works with professionals to do our very best to keep from being hacked and to keep people from stealing our e-mails and so forth,” Romney said in an interview last week. But that doesn’t prevent Russian efforts to sow discord or interfere with U.S. elections, particularly on social media. 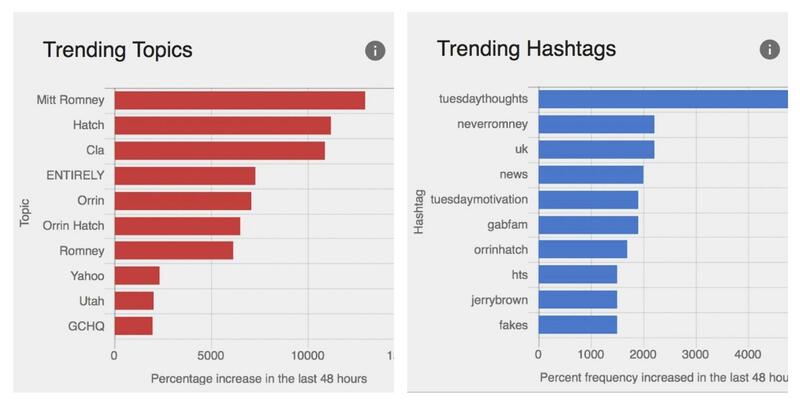 At least one organization has recorded spikes in the use of the hashtag #NeverRomney from suspected Russia-linked Twitter accounts this year. 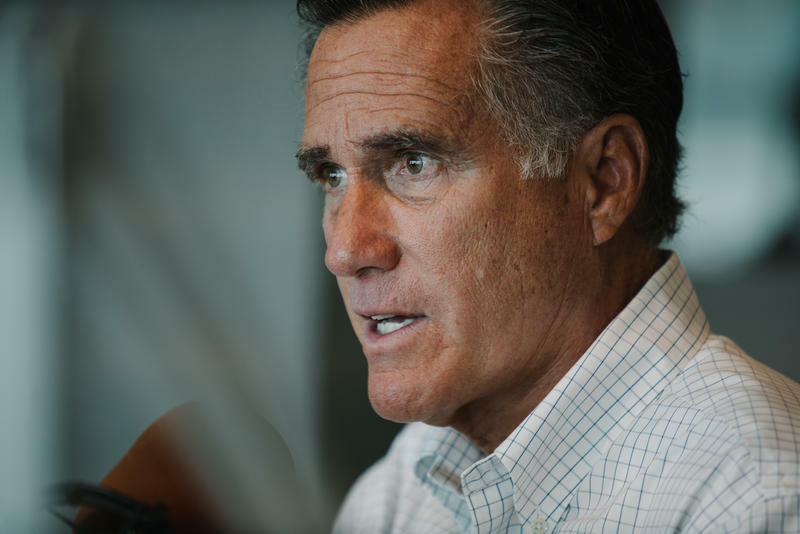 “There has been a low, but consistent, negative commentary about Romney. We’ve seen a few spike dates, including Jan. 2,” said Bret Schafer, a social media analyst at the Alliance for Securing Democracy. Jan. 2 was the day Sen. Orrin Hatch announced his upcoming retirement. At that time, Romney was only rumored to be considering a bid for the seat. Credit Screenshot / "Hamilton 68" Dashboard on Jan. 2, 2018. The Alliance for Securing Democracy is a bipartisan, transatlantic organization that emerged last year in an effort to battle Russian attempts to undermine democracies around the world. The group runs a project called the “Hamilton 68” Dashboard, which tracks about 600 Twitter accounts suspected of links to the Kremlin. The Alliance does not publicly identify the accounts it tracks because it says those accounts, if identified, would likely be abandoned. The vast majority of tweets from these accounts are about Syria, President Trump and global energy politics, Schafer said. But other issues — and people — get tweeted at, too. 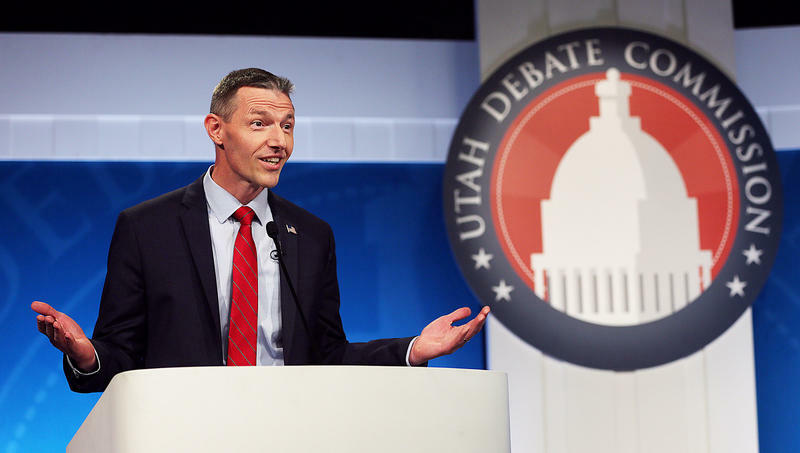 “It tends to be a pro-Trump crowd, so people who tend to get attacked in terms of politicians are Democrats, or what you might call the ‘never Trump Republicans.’ Romney and [Arizona Sen. John] McCain have been frequent targets of that,” he said. McCain and Romney, both Republicans, have been Trump critics at times, but they’ve also been critical of Russian President Vladimir Putin. "I do think it's not coincidental that Romney and McCain have seen a bit more vocal attacks [online] than Jeff Flake, for example," Schafer said. The Romney campaign declined to comment further for this story. The flak that Romney took for calling Russia a top foe a few years ago doesn’t seem so far-fetched today. “Romney was right about that one. They clearly are a huge threat,” said Jake Braun, a cybersecurity expert and former White House liaison to the Department of Homeland Security during the Obama administration. He believes it makes sense that Putin might target Romney. “Bottom line is yes, I think the Romney campaign is 100 percent right to be worried about this,” Braun said. The Alliance for Securing Democracy says, for now, it appears that Russia’s main goal is not to get one candidate or another elected. Russia’s primary objective is to undermine confidence in elections and other democratic systems, Schafer said. Russian-linked Twitter accounts also seem to be amplifying criticism and attacks on already divisive social issues, like NFL players kneeling for the National Anthem to protest racial inequality and police brutality. “These accounts were very, very very active in those conversations. Obviously, none of them care whether a player stands up or kneels,” he said. But many Americans care, and some will engage with those conversations online. “Once that audience is engaged, we’ll see an account, for example, tweet 10 times about NFL protests, and then the 11th tweet, which sort of comes totally out of the blue, is something about the U.S. working with ISIS and Syria,” Schafer said. The monitored Russian accounts jump on hashtags that already exist, in this case, things like #DrainTheSwamp and #NeverRomney. But does this strategy work in Russia’s favor? Schafer said it’s hard to tell if Russian bots and trolls posing as Americans tweeting passionately about Trump and other social issues had any impact in 2016. States, candidates and political organizations can try to prevent hacking by boosting their cybersecurity. But when it comes to avoiding influence from Russian-linked social media accounts, Schafer has only one piece of advice: Do not feed the trolls.